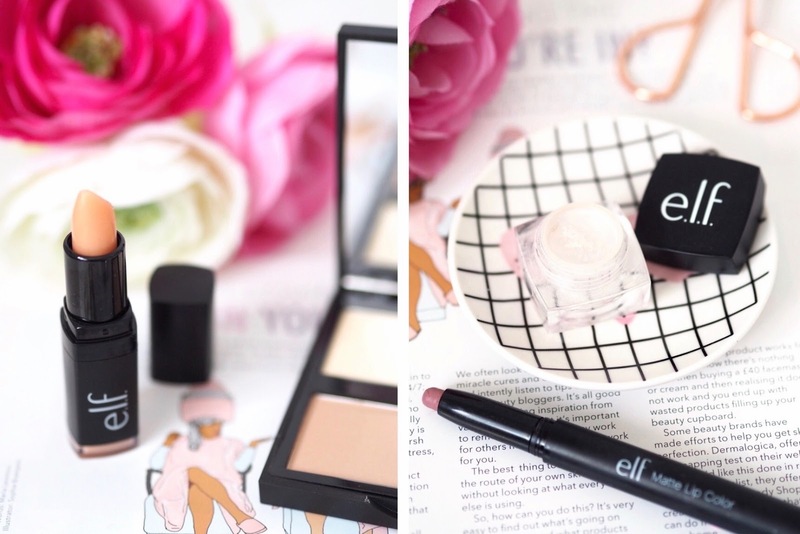 ELF are a brand that really bring back makeup memories for me, I can remember back in the early days of blogging everyone raved about their products and I soon fell for the hype. I always used to stalk the website for the 50% codes they used to do and when they did my inner makeup addict came out and I was out of control… never trust a makeup addict with a discount code! Over the years I’ve tried my fair share of products and I’m now lucky enough to be a member of the ELF Beauty Squad – yes I did cry happy tears when I saw that email in my inbox! 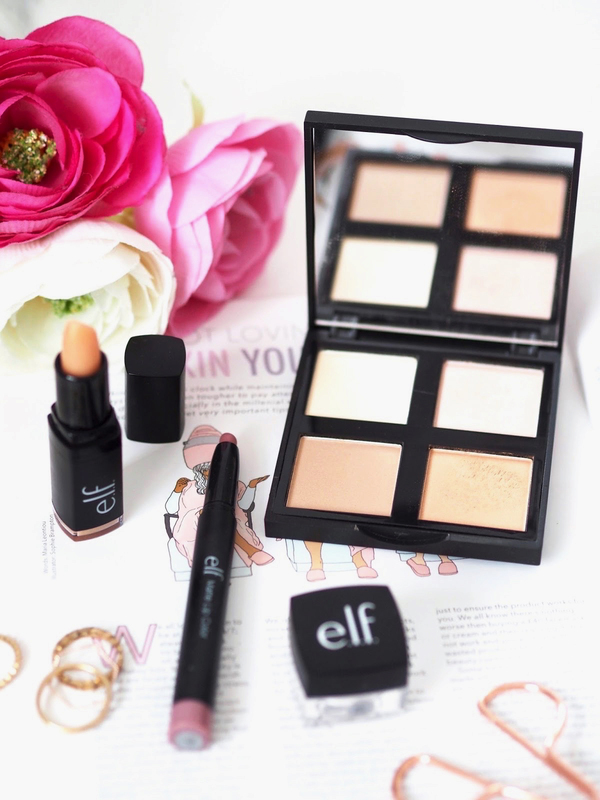 ELF are a brand I really like as they’re so affordable and I just get on really well with the products. Over the years I’ve tried a range of different products from them and my ELF collection is now reaching an almost obsessive point, oops. As they’ve recently come to Superdrug here in the UK (yaaaaay!) I thought I’d put together a post talking about my favourite products as they’re easier to get hold of now and I feel like it’s time a dedicate an entire post to some of my faves – trust me it was not an easy post to write as there’s so many products I love from them, expect a part 2 soon! first pick is the Illuminating Palette* which is actually one of my newest ELF discoveries but one I just can’t put down recently. 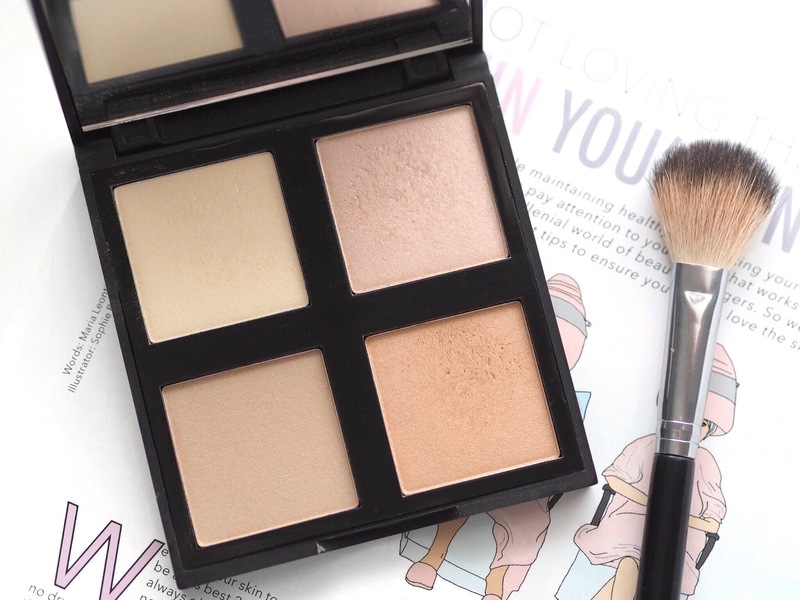 This palette contains 4 really easy to wear illuminating shades that blend into the skin like a dream. The thing to note is these are illuminators, not highlighters. Illuminators are designed to be applied over a larger area of the face than a highlighter, some people even set their whole face with them whereas highlighters are usually bright and more intense as they’re designed to be used in a more specific area to emphasise the high points of the face. As someone who goes through phases of fake tanning I find this palette perfect as the top two shades work best when I’m paler and the bottom two are perfect for when I actually have some colour on my usually ghostly face. The top left colour is a yellow toned white, the top right is a pink with slightly more shimmer than the others, the bottom left is a beige and the bottom right is a beautiful golden bronze. The powders are so soft and apply to the skin like a dream, I tend to use them on places I want to add some glow back into my face, such as on my cheekbones, above my brows, cupids bow and my nose. They add a subtle ‘glow from within’ and I just absolutely adore this palette. Lip products are something ELF do really well and one of my favourites has to be the Lip Exfoliator*. I’ve just seen they actually do different scents now and I need the cherry one in my life! I love how it’s in a lipstick form as it makes it so easy to apply, it leaves my lips feeling soft and smooth ready for me to apply my lipstick. Talking of lipstick, one I’ve repurchased for years is the Matte Lip Colour in Tea Rose*, a beautiful cool toned mauve pink. It’s not the usual lipstick shade I go for but there’s something that just makes me a little more glam when I’m wearing it. Whilst it’s matte it’s really comfortable to wear and I have no issues finding it drying, it also really long wearing, I’m obsessed. Out of all the ELF products one absolute holy grail for me not just from the brand but in general is the High Definition Undereye Setting Powder*. I use this everyday to set my concealer and whilst it may be small, you really don’t need much and I’ve found it’s actually lasted a long time. This powder is so smooth, is really helps soften my undereyes without being drying like I find a lot of powders can be. It sets my concealer perfectly and I’ve found adding this on top of my concealer actually adds a bit more coverage and it stops my concealer setting into fine lines, it’s an absolute must! Even after all these years I’m still loving ELF and I’m so glad they’re easier to get hold of now we can get them in Superdrug – I’m about to place an order now! Have you tried anything from ELF, if so what are some of your faves?